Throughout the month, NBC 4 Weatherman Fritz Coleman brings you "Fritz's Holiday Lights" each weeknight during The Channel 4 News at 11pm. 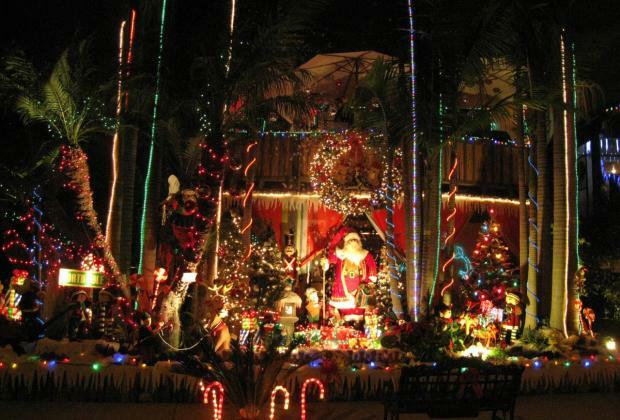 He's shown you the most elaborate and spectacular holiday light displays all across Southern California. Below is a list of the diplays you've told us about all month long, and which displays we have shown on The Channel 4 News. Look for our Fan Page on Facebook too! To see last year's gallery of lights, click here. Featured on Fritz's Holiday Lights Friday, Dec. 18th. Named 'Best Animated Display by city of Azusa. See it here! Featured on Fritz's Holiday Lights Thursday, Dec. 3rd. Two major displays, read about one of them here. Featured on Fritz's Holiday Lights Monday, Dec. 7th. Known as Canycane Lane. 25 Homes decorated. 60 Year tradition! Featured on Fritz's Holiday Lights Thursday, Dec. 24th. Dislay visible from the Northbound 2 Freeway! Featured on Fritz's Holiday Lights Monday, Dec. 14th. Featured on Fritz's Holiday Lights Thursday, Dec. 10th. Featured on Frtiz's Holiday Lights Friday, Dec. 4th. Display synchronized to music and broadcast on your car stereo! Featured on Fritz's Holiday Lights Wednesday, Dec. 9th. Display sychronized to music! See a video of it here! Featured on Fritz's Holiday Lights Wednesday, Dec. 16th. To see last year's display at this home, click HERE. Two major displays....neighbors in competition! Featured on Fritz's Holiday Lights Thursday, Dec. 17th. Major display synchronized to music and broadcast on your car stereo! Featured on Frtiz's Holiday Lights Tuesday, Dec 8th. Featured on Fritz's Holiday Lights Monday, Dec. 21st. Featured on Fritz's Holiday Lights Friday, Dec. 25th. 'Sleepy Hollow Neighborhood'...Hundreds of homes decorated! Featured on Fritz's Holiday Lights Tuesday, Dec. 15th. Featured on Fritz's Holiday Lights Tuesday, Dec. 1st. More than 60 Homes Decorated! Featured on Fritz's Holiday Lights Friday, Dec. 11th. Featured on Fritz's Holiday Lights Wednesday, Dec. 2nd. Entire block of snowmen on every lawn! Featured on Fritz's Holiday Lights Tuesday, Dec. 22nd. Beautiful homes decorated around a lake. Below is the list from Fritz's Holiday Lights 2008. We can't guarantee each display is up again this year...but we figure it's a good bet they are considering the amount of time and effort these people have invested in their displays! 2900 Block of Primrose Ave. Entire Neighborhood decorated...almost 200 homes participating! Featured LIVE on Fritz's Holiday Lights Wednesday, Dec 10, 2008. 800 Block of Grinnell Drvie. Featured on Fritz's Holiday Lights Wednesday, Dec 24, 2008. 500 Block of Florence Ave.
700 Block of N. Kenwood Street. 1100 Block of Gemini Ave. Known in the area as Camarillo Candycane Lane. 8000 Block of Mason Ave. Featured on Fritz's Holiday Lights Sunday, Dec 7, 2008. Entire neighborhood participating...including almost 100 handmade decorations and figures! Featured on Fritz's Holiday Lights Monday, Dec 22, 2008. 200 Block of E. Viewcrest Drive. Spectacular home...visitble from valley below. Featured on Fritz's Holiday Lights Tuesday, Dec 23, 2008. 1600 Block of Linda Rosa Ave.
300 Block of Temmera Lane. 1300 Block of Barranca Ave. Winner of the City of Glendora's Best Animated Display. Featured on Fritz's Holiday Lights Tuesday, Dec 16, 2008. 1300 Block of Glencroft Road. Winners of the City of Glendora's Best Use of Lights and Best Lawn Display across the Street from one another! Featured on Fritz's Holiday Lights Saturday, December 20, 2008. 1100 Block of Flamingo Street. Winner of the City of Glendora&apos;s Sweepstakes Award-overall best display! Featured on Fritz's Holiday Lights Thursday, Dec 25, 2008. 10400 Block of Blucher Ave. Featured LIVE on Fritz's Holiday Lights Monday, Dec 1, 2008. 17500 Block of Ludlow Street. 11500 Block of McLennan Ave.
9500 Block of Panacea Drive. South 5th Avenue, between Manchester Blvd. & Century Blvd. 100 Block of Cape Cod. 3500 Block of Santa Carlotta Street. Featured on Fritz's Holiday Lights Friday, Dec 12, 2008. 1800 Block of Arbolita Drive. Featured on Fritz's Holiday Lights Sunday, Dec 14, 2008. 44900 Block of 5th Street East. 3000 Block of W. Albret Street. 20th Street West & Ave. J-8. 4500 Block of W. 147th Street. Featured on Fritz's Holiday Lights Monday, Dec 15, 2008. 3000 Block of E. Ocean Blvd. 5200 Block of E. Willow Street. Many homes decorated along canals...annual contest. Featured LIVE on Fritz's Holiday Lights Thursday, Dec 11, 2008. 1800 Block of Ostrom Ave.
500 Block of 15th Street. Featured on Fritz's Holiday Lights Friday, December 26, 2008. 200 Block of Alta Vista. 39600 Block of Avenida Miguel Oeste. 2400 Block of Hillside Ave.
6400 Block of Radford Ave. Featured LIVE on Fritz's Holiday Lights Tuesday, Dec 2, 2008. Featured on Fritz's Holiday Lights Friday, Dec 5, 2008. 12200 Block of Everest Street. Featured LIVE on Fritz's Holiday Lights Thursday, Dec 18, 2008. 1000 Block of Medford Road. Each street features its own theme in the parkways. Neigborhood featured LIVE on Fritz's Holiday Lights Monday, December 8, 2008. 18500 Block of Brasilia Drive. Two neighbors competing with one another! Featured on Fritz's Holiday Lights Tuesday, Dec 9, 2008. 1800 Block of N. Diamond St.
3000 Block of E. Craig Drive. 7900 Block of Jennet Street. 2800 Block of Loyola Street. 5900 Block of Mountain View Ave.
8500 Block of Running Gait Lane. 7600 Block of Frazer Drive. 16200 Block of Lost Canyon Road. 20900 Block of Canterwood Drive. 3900 Block of Longview Valley Drive. 400 Block of Highland Road. 200 Block of Cliffwood Drive. 26400 Block of Kipling Place. 6200 Block of Belmar Ave.
45500 Block of Manatee Way. 44800 Block of Shale Circle. 900 Block of W. Marcello Ave. Featured on Fritz's Holiday Lights Saturday, Dec 6, 2008. 1700 Block of Wellesley Drive. 2600 Block of Sonoma Street. Sleepy Hollow Area...Surrounding Doris Way & Vanderhill Road. Entire Neighborhood decorated...Hundreds of Homes! Featured LIVE on Fritz's Holiday Lights Friday, Dec 19, 2008. Greenwood & 230th street . Featured LIVE on Fritz's Holiday Lights Wednesday, Dec 3, 2008. 27000 Block of Alabastro Drive. 23800 Block of Claymore Way. Featured on Fritz's Holiday Lights Saturday, Dec 13, 2008. 5800 Block of Murietta Ave. Featured on Fritz's Holiday Lights on Sunday, December 28, 2008. 4700 Block of Farmdale Ave.
11700 Block of Kling Street. Featured on Fritz's Holiday Lights Sunday, December 21, 2008. 5700 Block of Woodman Ave.
19700 Block of Camino Arroyo. 6500 Block of Bestel Ave.
16000 Block of Hornell Street. 5800 Block of Lubao St. Many Homes Decorated...known as Candycane Lane! Featured LIVE on Fritz's Holiday Lights Thursday, Dec 4, 2008.